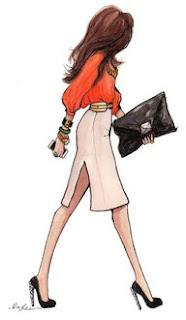 Today I am of course linking up with The Vintage Apple for... this is one of my fav link ups.This week I have chosen a few fashion drawings I am loving. There is something about a fashion drawing that I just love. I would love to have a giant closet filled with just clothes, shoes, accessories and wall to wall framed fashion drawings.A girl can dream right? 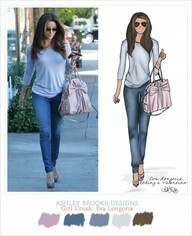 I find Ashley Brooke's creations so fun and creative. This is her taken on Eva Longoria. Or how about my girl LC. If I could have any celebrity hair I think I want hers. How does she get it to look so dang amazing every single time? Or how about some Brittany Fuson. She takes runway looks and makes drawings out of them and makes them her own. All of her stuff is so adorable and with a bit of a fun girl whim. Her maternity line is so cute you should check that out too. This pic is neither Ashley Brooke nor Brittany Fuson but I just love it. The business woman on the go. 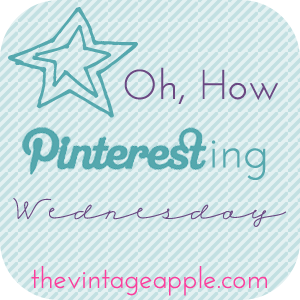 Cute pins & you, hands-down, have the cutest blog name I have ever heard! love these sketches, totally saving them for my own pinterest! 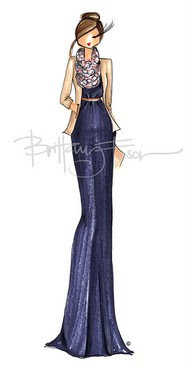 I love Brittany Fuson's work! It's so pretty!